«Into The Sunrise» is a men’s hand-made nuno felt scarf designed exclusively for a professional landscape photographer Gleb Tarro. Inspired by American Southwest landscapes, the scarf’s foundation is a twilight-colored finest natural chiffon silk with soft black merino wool shadows and a white “daybreak” shining with yellow and orange sun rays. Film perforation elements along the edge of the scarf is a finishing touch of this masterpiece. 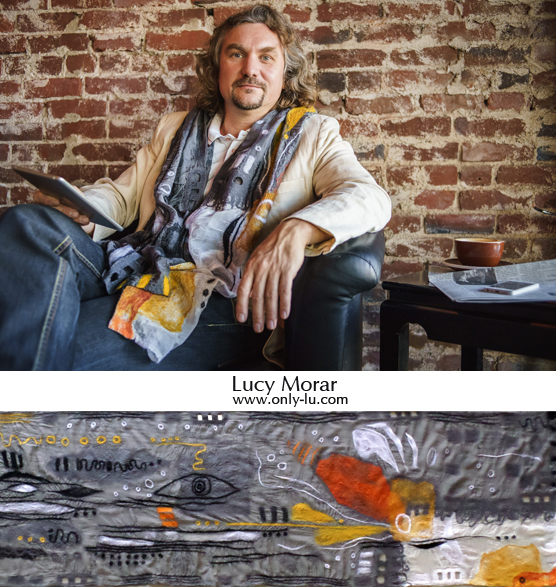 This entry was posted in for men, nuno felting, scarf on February 26, 2015 by Lucy Morar. «Abstract Logic» ordered as a gift to a gentleman and Pablo Picasso enthusiast, this nuno felt scarf had been designed in neutral and soft colors with abstract geometric forms and lines coming along with fine-line sketches of humane figures. It’s like looking at images of life in more formal and abstract way. Handmade of finest natural chiffon silk and merino wool. 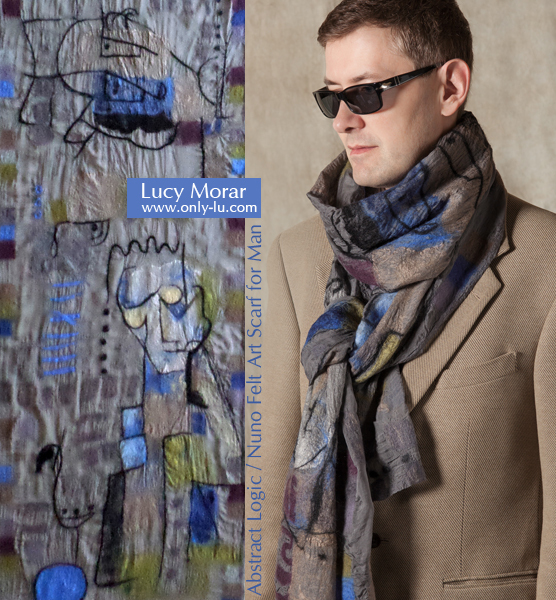 This entry was posted in for men, nuno felting, scarf on January 25, 2015 by Lucy Morar.